Our dedicated education & outreach officer visits primary schools across the county as part of our services for schools. We can provide curriculum linked sessions on any aspect of Lincolnshire's rich history. See below for a sample of what we can offer. We use object based learning in all our school visits, so your children will get the chance to handle real artefacts and discover history first hand. Our sessions are half day in length but can be repeated if you would like us to work with several classes. We can also offer longer bespoke WOW days on any of these topics. For half day visits we ask for a donation of £150, or £250 for a full day. Our team regularly work with younger children and recent sessions have included an activity day celebrating medieval village life, wool spinning demonstrations, workshops on what archaeologists find underground, and even a tour of our headquarters at the Old School in Heckington. Speak to our education & outreach officer about how we can help your class discover the history on their doorstep. Find out how Heritage Lincolnshire's archaeologists use artefacts to discover what life was like in this remote period before records began. Pupils will learn to think like an archaeologist; playing 'the rubbish game' using familiar modern objects as clues to build a picture of who might have thrown them away. We'll also work together to make a human timeline so that everyone understands the chronology and its tricky terms. Then its time to get hands-on with real prehistoric artefacts from our handling collection! Discover what the Romans really did for us, from letters and numbers to roads and even the towns and cities we live in. 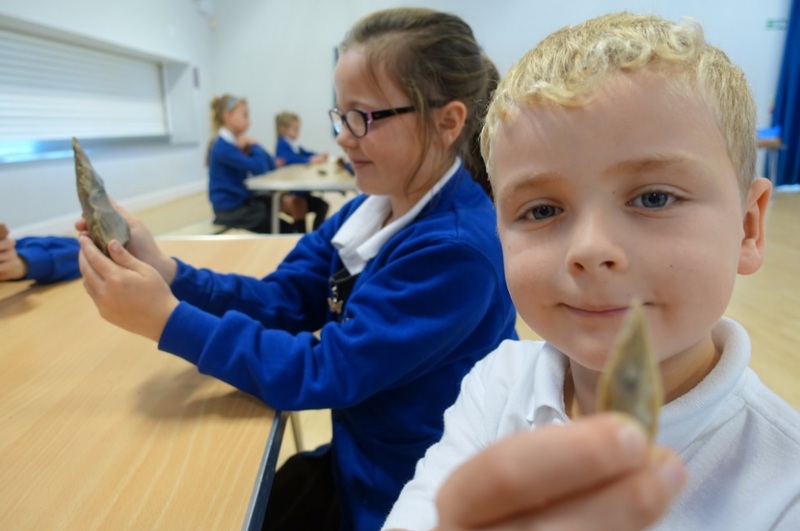 Lincolnshire owes a lot to the Romans and in this session pupils get the chance to find discover how using real Roman artefacts from our excavations across the county. There's even a game to to help pupils find out just how many foods we eat everyday were first brought to Britain by the Romans. Explore how invaders fought for control of Lincolnshire after the collapse of Roman Britain. Pupils will find out how the county became an independent Anglo-Saxon kingdom, and discuss why the Vikings came to destroy but stayed to settle here. Using artefacts from our handling collection children will also have the chance to find out more about what life was like for local people during this 'Dark Age'. Uncover what life was like in Lincolnshire during one of the most dramatic periods in its history. A time when great castles and abbeys were built, bishops ruled, merchants traded, and a Lincolnshire man became King of England. Pupils will use real artefacts from Heritage Lincolnshire's excavations across the county and illustrations from the famous Luttrel Psalter to explore medieval life in castle, manor, abbey, and cottage. You don't have to go far to find medieval buildings in Lincolnshire, so why not visit a site near you? Heritage Lincolnshire cares for an abbey, a manor house, a castle and a Knights Templar tower.